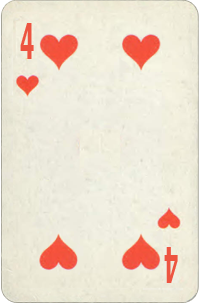 Four of Hearts Birth Card. Free Destiny Cards Reading. Qualities of the Birth Card are modified by astrological influences of planets associated with the Sun position at the moment we are born. If you are born on October 31, 1980, Pluto and Marsthe planetary rulers for your astrological sign (Scorpio) are Pluto and Mars. Your Sun is positioned approximately in the First decan of Scorpio, ruled by Pluto and Mars. Find out the exact degree of your Sun placement to make sure your Planetary and Decanate cards are correct.